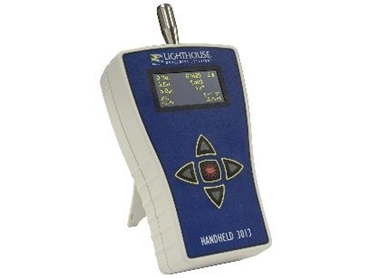 Lighthouse Worldwide Solutions’ HANDHELD 3013, a handheld particle counter distributed by Particle & Surface Sciences , is ideal for use where a smaller lightweight handheld counter is needed. Offering three channels of simultaneous particle counting, the HANDHELD 3013 displays both cumulative and differential particle count data on its easy to read 3.8” screen. Using an ergonomic and lightweight design, the rechargeable battery allows up to eight hours of continual operation. Users can easily download data through the USB port using the Lighthouse data transfer software, LMS XChange. The HANDHELD 3013 will monitor particulate levels accurately and reliably, even in those hard-to-reach areas where two-handed operation is unsafe. The Lighthouse airborne particle counters include hand-held and portable counters that can be used alone or integrated with a large facility monitoring/management system.